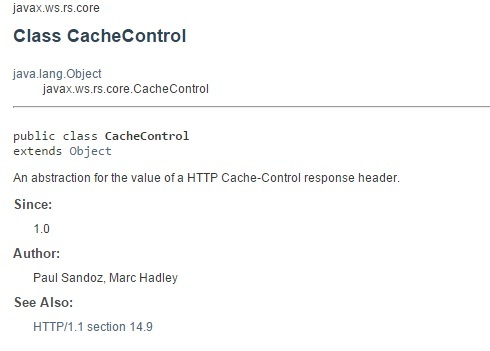 The Cache-Control header was added in HTTP 1.1 as a much needed improvement over the Expires header available in HTTP 1.0. RESTful web services can make use of this header in order to scale their applications and make them more efficient e.g. if you can cache a response of a previous request, then you obviously need not make the same request to the server again if you are certain of the fact that your cached data is not stale! How does JAX-RS help ? So how to I use the CacheControl class? Just return a Response object around which you can wrap an instance of the CacheControl class. CDI Producers to the rescue! CDI Producers can help inject instances of classes which are not technically beans (as per the strict definition) or for classes over which you do not have control as far as decorating them with scopes and qualifiers are concerned. A GET Request to the same URL will not result in an invocation of your server side REST service. The browser will return the cached value. This entry was posted in Java, Java EE and tagged Caching, cdi, CDI Producer, HTTP 1.1, JAX-RS, quickbyte, REST. Bookmark the permalink. the problem, as far as I know, is that there is no equivalent feature in JaxRS specification so its vendor specific. thanks, also glad you like my stuff. I think Dynamic feature can do the job, will try it later (and maybe blog). Thanks for the hint.